There have been Lewins in Datchet since at least the 1700s. James Albert Lewin, remembered on Datchet’s War Memorial, was the third in a line of James Lewins in the village. His grandfather, James, born in 1826, was a general dealer at Datchet Common. He married Harriet Hunt and they had at least 10 children, many of whom remained in the village. His father, James, born in 1860, was a builder and bricklayer. He married Jane Thomas in 1881 and they set up home at Pitts Gardens, near Penn Road. By the 1891 census, James and Jane had three sons, eight-year-old James Albert (known as Jim, baptised 10 August 1882), six-year-old Thomas (Tom), and four-year-old William. They were living at Alma Place. 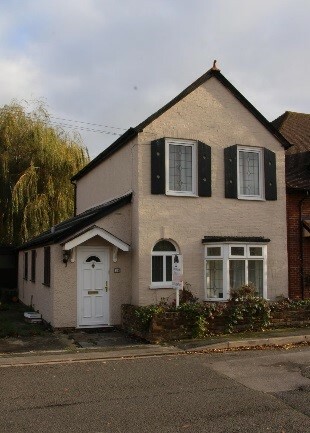 Rather than going to the pub, Jim’s father spent his spare time and money building a home for his young family on a plot at 18 Penn Road. He used to say that every drink he missed bought another brick and so he named their house Temperance Cottage. Before the reservoir was built, the cottage had views over the fields and the polo ground. The family grew their own vegetables and kept pigs in a sty and ducks and chickens in the yard. They had their own water pump and an outdoor toilet. In 1894, another child, Eleanor, was born at Temperance Cottage, a sister for the three boys. She was said to be the first baby born in Penn Road which was then not much more than a rutted cart track. Much later, in a 1964 newspaper interview, Jim’s brother Tom remembered that during Eleanor’s first winter, Datchet experienced a severe flood which left its waterline four feet up the wall of the Working Men’s Club (now the library). The family with their young baby had to evacuate the flooded ground floor of Temperance Cottage and move upstairs. Their father brought food from the village by punt while their mother tried to cook on a fire grate. The flood was followed by a frosty new year which brought a covering of ice on the Thames and ice-skaters to Datchet’s waterfront. Tom’s newspaper interview tells us what Christmas Day was like for Jim and his family at Temperance Cottage. The house was filled with the smell of a chicken roasting and a plum pudding steaming on the open range. The boys put on their best Eton collars and knee breeches for their obligatory visit to church and in the evening relatives and friends came round for a glass of parsnip or elderberry wine. They all gathered around the piano, under the homemade paper chains and light of the paraffin lamps, for carols and a sing-song. ‘We had a great time making our own fun,’ Tom told the reporter. All three boys, Jim, Tom and William, learned their father’s trade and followed in his footsteps. Tom started off driving a horse and cart for his father, taking bricks from Langley to the village branch of Barclays Bank (now Julian Bettney’s art gallery) which was then under construction. Around 1904 their father took on the council contract to clear cess pools and collect refuse. Their carts had to be out of the village by 7am so the unpleasant work, done with a hand pump, had to be completed during the hours of darkness. Christmas 1905 was particularly special for Jim. On 25 December, aged 23, he married Bessie Sophia Cutler, a local girl from Eton Wick. Jim and Bessie lived at Temperance Cottage where they had three children, Bessie Elizabeth, born 1907, and William James Albert, born 1909, and Mabel born 1911. 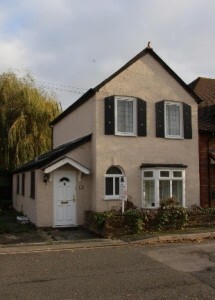 Jim’s parents and sister Eleanor moved to Eleanor Cottages, a group of four cottages which the family had also built in Penn Road. Work sometimes took Jim away from his young family. In the 1911 census, he and his brother William, both recorded as bricklayers, were lodging with a family in Salisbury. 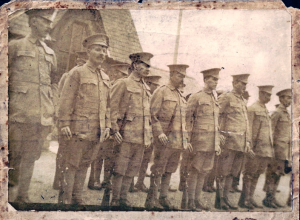 This photograph of Jim with a group of soldiers outside the village school, is courtesy of his descendant, Peter Mace. It is believed that Jim is the man looking at the camera, second from left. 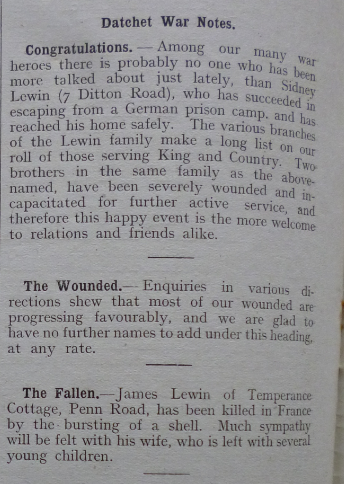 Many of the Lewin men signed up to fight. Datchet’s Roll of Honour lists 11 Lewins, all related. Tom joined the local defence volunteers. He was drilled in Holmlea Road by the local police sergeant Benning, a former colour sergeant in the army, and was called to active service in France with the South Wales Borderers. Jim enlisted in Windsor as Private 19394 of the Royal Berkshire Regiment. 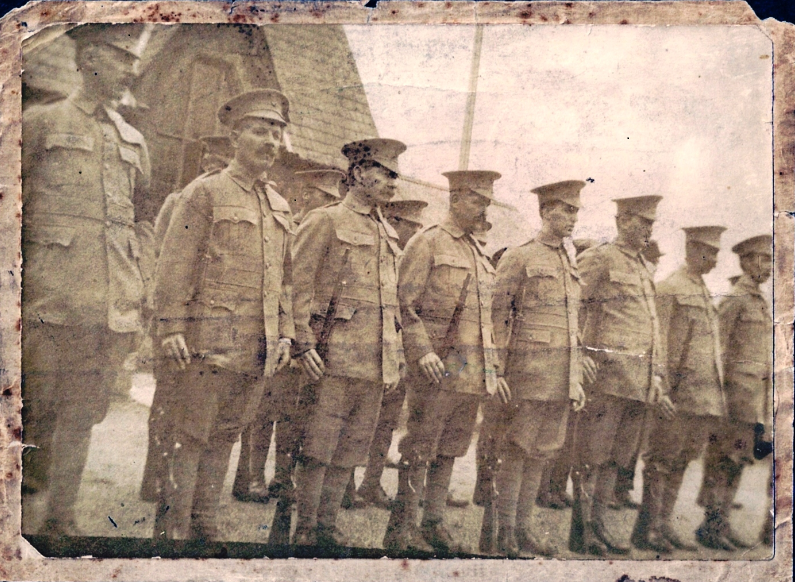 He joined the 1st Battalion, was moved to the 2nd, then transferred to the 6th which landed in France in July 1915. Jim’s wife, Bessie, gave birth to another child, Ivy, in spring 1916 but it’s not known if Jim ever had the chance to see his baby daughter. 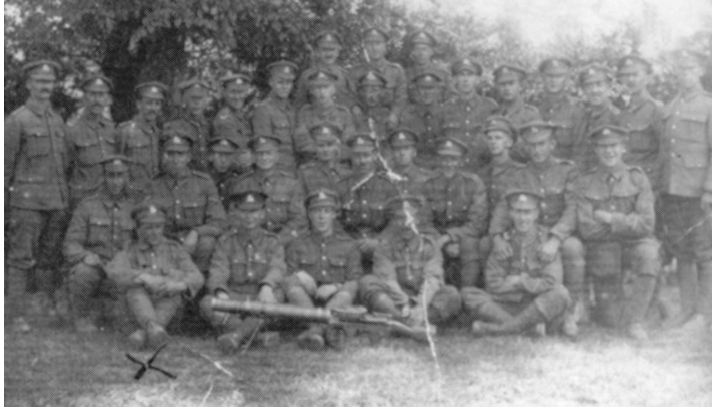 The 6th Battalion Royal Berkshire Regiment website shows the itinerary of the 6th from the date it landed in France in 1915. See also itinerary part II. 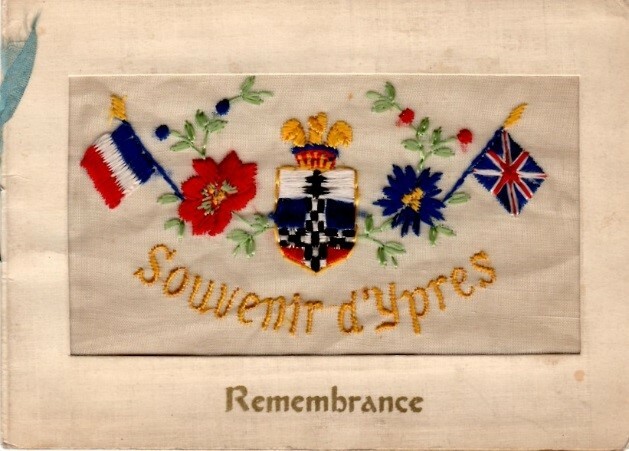 In November 1917, during the Third Battle of Ypres, the 6th Royal Berkshires were on the front line near Boesinghe (now Boezinge). It was here on 6 November that James Albert Lewin was killed in action by the bursting of a shell. Jim’s death was reported in the Datchet Parish Magazine in December 1917, left. The same issue of the Parish Magazine also reported that his cousin, Sidney, of 7 Ditton Road, had escaped from a German prison camp and two other cousins had been severely wounded. 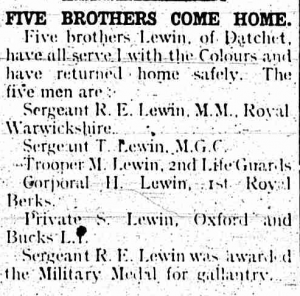 On 8 March 1919, the Slough Eton & Windsor Observer reported that five of Jim’s cousins, sons of his Uncle Robert and Aunt Susan Lewin, had all returned from the war. James Albert Lewin is remembered on the Tyne Cot Memorial, at Zonnebeke, West Vlaanderen in Belgium. The memorial bears the names of almost 35,000 officers and men whose graves are not known. It is one of four memorials to the missing in Belgian Flanders which cover the area known as the Ypres Salient. He was awarded the British War Medal and the Victory Medal. We are currently researching the Lewin family in Datchet. can we arrange to meet to share information please ? Ronald Lewin and Susan Bennett. Many thanks for getting in touch. Yes, we’d very much like to share information with you. I have sent you an email. Alison Crampin, Datchet Village Society. My grandad was William Lewin whose father – also William Lewin was Jim’s brother. I went to Datchet once with my granddad who showed me Temperance cottage and the site opposite that used to be their builders yard sold for £300 for development of the new houses and told me a few things that may interest you although you have probably researched this much more than myself and know a lot more than me. I would be pleased to hear from you and tell you the little past on to me about the Lewins in Datchet. Many thanks for your email and for sharing some of your memories. I’ve sent you a separate message putting you in touch with Ron and Sue. We too would be very interested to hear more. 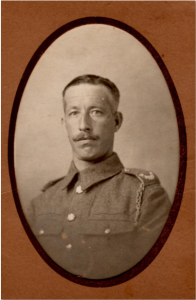 I am researching the life and military career of 10094 Pte Herbert Lewin 1/ Royal Berkshire Regiment who was born at Datchet in 1896 and was awarded the Military Medal in 1920 for his successful escape from Burgsteinfurt POW camp in 1918. I believe he is the Pte H Lewin referred to on your website as having four brothers fighting in the war. His parents were Robert and Sarah Lewin. I wondered whether you had any further information that might assist me. Many thanks for getting in touch with us. 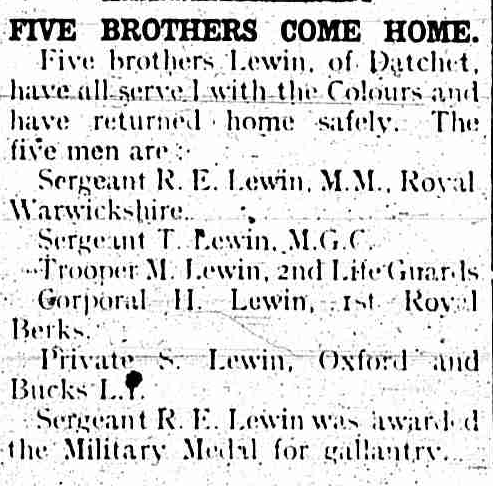 How interesting that two Lewin brothers were both awarded Military Medals. I’ve have sent you an email with more information.